As the 2014 mayoral primary campaign season picks up steam, most candidates have centered their attacks on Mayor Vincent Gray, trying to tell a story of pervasive corruption and a failed economic revival. 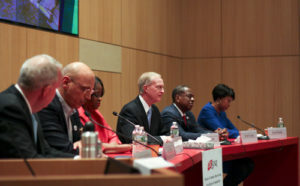 Foggy Bottom’s Council member Jack Evans, however, has instead praised the embattled incumbent’s administration, looking to remain above the fray as other candidates cry foul over city fraud. Gray has still not announced whether he will run for reelection. Evans, who is the longest-serving D.C. Council member, was the only candidate not to take aim at Gray’s administration during the campaign’s first debate last week. When candidates were asked to name failures of the current administration, Evans said the only place that Gray and his predecessor Adrian Fenty failed was in supporting D.C.’s arts scene. Council member and mayoral candidate Tommy Wells, D-Ward 6, was one of Gray’s sharpest critics during last week’s debate, as he accused Gray of mismanaging city emergency services. Wells and other candidates also slammed the mayor’s ties to a $650,000 shadow campaign that has brought many of his former staffers to court. Gray has denied any wrongdoing or knowledge of the fund as federal officials continue to investigate. When criticism of Gray’s shadow campaign surfaced in the Council in July 2012, multiple members of the Council – but not Evans – called on Gray to resign. Evans, who claims to have the best relationship with Gray of any of the mayoral candidates, said this week that he is not attacking Gray’s campaign fund because he would rather focus on the GW alumnus’ time in office. “When I say he’s doing a good job, I’m not condoning what he did with the campaign, but I am looking in a more narrow way at the progress that he’s making,” said Evans, who has worked with five mayors in his time as a member of the D.C. Council, including Gray. “We have a good relationship and a good working relationship,” Evans added. Former Council member Sekou Biddle said Evans’ praise of Gray’s administration could spell trouble for the Foggy Bottom representative if the mayor decides to seek reelection. Mayoral candidates picked up nominating petitions about two weeks ago, and have until Jan. 2 to collect the 2,000 necessary signatures to appear on the Democratic primary ballot in April.